I got the following alert last night from the Illinois State Rifle Association. It appears that the gun prohibitionists are still at it in their efforts to have state licensing of gun stores in Illinois. This would be over and above what is required by the Gun Control Act of 1968 and BATFE. They are trying to use an amendment to an environmental protection bill to put gun dealers out of business. On a positive note, there is an amendment to a crime bill that would allow Illinois residents to own suppressors. If you are an Illinois resident, call your representatives and senators. If you recall HB 1016 with Amendment #6 was voted down on Friday. It was expected to be called for a vote again today, but that did not happen. However the anti-gunners, the ARS, the Bloomberg Moms and others were combing the halls today trying to pick up votes for this thinly veiled attempt at curtailing your Second Amendment rights. It is expected that it will be called for a House vote again tomorrow. Yes, you are reading it correctly, the Illinois General Assembly will be in session on Memorial Day. What Would Be A Suitable Punishment For These Vandals? How about this: they have to go and meet with the families of those missing in action who have suffered for up to 50 years not knowing what happened to their fathers, husbands, brothers, and sons and explain just what the hell they were thinking when they "tagged" that memorial. I doubt they will be able to truly justify their actions. If they have any feelings, if they are sentient beings, they should feel profound shame at their actions. Perhaps this will get their lives turned into something productive. I was lucky. My father came home from the Republic of Vietnam. Twice. Though he wasn't in combat, his name could have been up on that wall or the one in Washington, DC. As I said, I was lucky unlike the families of those men listed on that wall in Venice, California. The Anchorage Police Department received complaints about an obnoxious driver last weekend. They were very concerned as the vehicle involved had flashing red and blue lights and thought they might be dealing with someone impersonating a police officer. They asked the public for help in identifying the driver. The driver in question, a white male in his 30s with short hair, came up behind multiple cars, flipped on his flashing lights and then would speed past them when they yielded. Oh, and he would laugh at them while flipping them the middle finger. One of the motorists who had been pulled over took a picture of the license plate of the vehicle in question. This is where it really gets interesting. The APD went to run the plate against the DMV database and came up empty. Thinking it might be an undercover car of the Alaska State Police, they contacted them and also came up empty. After a few days of detective work by APD, the car and unidentified driver were traced to a federal law enforcement agency - the Bureau of Alcohol, Tobacco, Firearms, and Explosives. In a later release, APD said they were informed that this employee of BATFE was "on official business at the time of the incident". ATF's Seattle office, which also oversees operations in Alaska, declined to answer questions Tuesday about the bureau's policies regarding unmarked vehicles or whether any disciplinary action had been taken. The office released a brief statement from special agent in charge Doug Dawson. "ATF is aware of the allegations made in the complaint and is investigating the incident," Dawson said. "Further, as a matter of policy, ATF does not comment on personnel matters." I'm guessing the BATFE agent in question was confused by his agency's directives on trafficking. He must have thought it had something to do with traffic enforcement as opposed to trafficking in guns, dynamite, moonshine, or cigarettes. Two Second Amendment groups and three individual plaintiffs including a Congressional candidate have filed suit against California Attorney General Kamala Harris. The suit filed in US District Court for the Eastern District of California seeks an injunction against a California law that makes it illegal to use video footage from the California State Assembly in a political campaign or ballot initiative. The suit is brought on First Amendment grounds as the law restricts political speech. The plaintiffs would have used video footage from the State Assembly to produce ads opposing Lt. Gov. Gavin Newsom's gun control ballot initiative and the gun control bills being rammed through the legislature. One of the individual plaintiffs is filmmaker Kris Koenig who produced the Second Amendment documentary Assaulted: Civil Rights Under Fire. An interesting note about the lawsuit is that UCLA law professor Eugene Volokh who blogs at the Washington Post's Volokh Conspiracy is one of the attorneys representing the plaintiffs. A release with more details on the case and the plaintiffs is below. SACRAMENTO­­­­­­ – Today, two civil rights groups opposing Gavin Newsom’s gun control ballot initiative were joined by two Emmy Award-winning filmmakers, a San Diego-based civil rights activist, and a candidate for Congress in filing a new First Amendment lawsuit challenging the State of California’s ban on using Assembly video footage for political speech. Tim Donnelly, a plaintiff in the case who is currently running for Congress, was previously threatened by the Assembly Rules Committee for using a clip of a hearing in which he participated as an elected Assembly member. Violating the statute is a misdemeanor crime that can lead to imprisonment in a county jail for up to six months, a fine of up to one thousand dollars, or both imprisonment and fine. Because of the importance of political speech and the criminal liability under the statute, the plaintiffs say they’ll be asking the court to issue a restraining order against the law. “Millions of good, law-abiding people are at risk of becoming criminals through dozens of new gun control bills and the most dangerous, anti-civil rights ballot initiative we’ve seen in decades,” explained Firearms Policy Coalition Second Amendment Defense Committee Chairman Brandon Combs. “Yet Section 9026.5 says it would be a crime for us to use video of the people’s Assembly hearings and votes in political speech. It is shocking that this law was ever passed in a state that claims to value diversity, tolerance, free speech, and open government. “Assembly Speaker Anthony Rendon and Senate President Kevin de León are playing fast and loose with legislative rules, but California law says that it’s a crime for us to use Assembly video to oppose their extreme agenda. We filed this lawsuit because we’re not going to stand by and watch while Senator de León and Gavin Newsom compete to burn the Bill of Rights to the ground first,” concluded Combs. The plaintiffs are represented by Bradley Benbrook and Stephen Duvernay of Benbrook Law Group, PC, and Eugene Volokh, a UCLA law professor who has written and taught extensively about the First and Second Amendments. Before joining the UCLA faculty, Volokh clerked for Judge Alex Kozinski of the Ninth Circuit Court of Appeals and Justice Sandra Day O’Connor of the U.S. Supreme Court. He also operates the popular legal blog “The Volokh Conspiracy,” now hosted at the Washington Post. A copy of the complaint for Firearms Policy Coalition Second Amendment Defense Committee, et al. v. Attorney General Kamala Harris can be viewed or downloaded at www.fpcsadc.org/wp-content/uploads/2016/05/2016-05-26-Complaint-filed.pdf. Firearms Policy Coalition Second Amendment Defense Committee (FPCSADC) is the official pro-gun grassroots political action committee (PAC) dedicated to opposing Gavin Newsom’s gun control ballot initiative. FPCSADC was formed days after Newsom announced his intention to put his gun control scheme on the November 2016 ballot and has been fighting against the initiative since its inception. More information about FPCSADC can be found at www.StopNewsom.com. Firearms Policy Coalition (FPC) is a grassroots, nonprofit public benefit organization. FPC’s mission is to protect and defend the Constitution of the United States, especially the fundamental, individual Second Amendment right to keep and bear arms. More information about FPC can be found at www.firearmspolicy.org. I posted an article from Politico on Facebook yesterday. The article said the NRA was facing member backlash from their endorsement of Donald Trump on Friday. I noted that I thought Politico was stretching to find NRA members who were opposed to the Trump endorsement. I compared it to finding people at the Annual Meeting who were in favor of universal background checks. You would find them if you looked hard. I went on to add that Politico was a part of the mainstream press whose job it seems is to get Hillary elected even if she does treat them like something she found on the bottom of her shoes. I thought what I said was fairly uncontroversial. I have lost track of how many comments and replies pro and con the Trump endorsement that I have received. Some of the comments have up to 50 replies to them. Much of it is back and forth between people who oppose the endorsement and those who thought the NRA right to do the endorsement. To get a true feel for it you need to read the comment and then the back and forth replies. The comments on both sides of the argument have come from people within the gun culture whom I respect for their devotion to the Second Amendment. Given that, I do see that the endorsement of Trump was more controversial than I thought. My take on why the NRA-ILA and NRA-PVF made the endorsement now is that it was pragmatic politics. The NRA is nothing if not a practitioner of realpolik. The pragmatic consideration is that an early endorsement at a time when it would get lots of media attention cements the NRA as one of the inner circle of organizations who will have the ear of a President Trump. It is already a given that the NRA will have no seat at the table under a President Clinton. She has already declared us as one of her prime enemies. The NRA could have waited to make the endorsement later in the campaign season but they would have risked that endorsement getting lost among other endorsements. Moreover, as some have suggested, they could have just foregone an endorsement of Trump as they have done with some past Republican nominees. Given Trump's past pro-gun control comments, they could have been excused for going this route. That said, 2016 Trump is very pro-gun, has made very pro-gun statements throughout the campaign, and has very pro-2A positions posted on his website. It could be posited that the NRA endorsement is a reward for coming over the from the dark side. As I said above, I do see the endorsement of Trump as being more controversial than I thought. However, pragmatically, I don't see that the NRA had any other choice than to do what they did. I listened to Donald Trump's speech at the NRA-ILA Leadership Forum yesterday. Two things stood out for me. First, and most important, I really do believe that Trump understands the issues surrounding the Second Amendment and gun rights. In his speech he referenced the makeup of the Supreme Court, judges, concealed carry permits, the threats to the Second Amendment, self-defense, and gun free zones. The latter two, self-defense and gun free zones, are two areas that he really highlighted. Noting the Paris Massacre in a gun free zone, Trump said he doubted that it would have gone on long if held at the Annual Meeting due to the number of armed citizens. (As a sidebar, due to the Secret Service and their protective rules, Trump *was* speaking in a gun free zone.) Trump spoke of single moms in Florida and grandmothers in Ohio that would be left defenseless if Hillary was elected. That lead to his newest nickname for Clinton as "Heartless Hillary". Though, he admits, he still really likes "Crooked Hillary." Second, listening to a Trump speech is an exercise in patience. This is not because of what he says but how he says it. The man has a severe case of attention deficit disorder when it comes to public speaking. He'd start out on a topic and then ...SQUIRREL! and he'd be off on a tangent. He makes some good points but he can be damn hard to follow. I read some discussion yesterday on Sebastian's blog on whether or not the NRA should have endorsed Trump. In my opinion, the NRA did not have much of a choice. They deal in realpolitik. Their avowed foe Hillary Clinton has doubled down and made gun control, the Second Amendment, and the NRA her number one target. This is a two-person race unless Bernie decides to run as an independent which Trump encouraged in his speech. The NRA has to pull conservatives who supported other candidates and gun owners who don't trust Trump back into the fold. Without them, Hillary most likely will win and the Second Amendment will be lost as an actual civil right. It will become a historical artifact. That is something the NRA can't live with and I certainly won't live with. I'm listening the NRA Leadership Forum as I write. There have been some good zingers against Hillary from Wayne LaPierre and Chris Cox. In the meantime, Democrats in California are pushing more and more gun laws. This release from the Firearms Policy Coalition gives more details on this "gunpocalypse". Civil rights group says gun-owners are being used as pawns in a turf war between Lt. Gov. Newsom, Sen. de León. SACRAMENTO – Ten anti-gun rights bills were fast-tracked through the California State Senate today on a party-line vote of Senate Democrats led by Senate President Pro Tempore Kevin de León. The slate of proposals attacking California gun owners included four Assembly bills that were “gutted and amended” in the Senate just two weeks earlier in an effort by Democrats to avoid a full legislative vetting process and public scrutiny. On the floor, debate about the need for the bills centered on a political turf war between Lt. Governor Gavin Newsom, sponsor of a gun control ballot initiative opposed by my California legislators, and de León, who, ironically, views the ballot initiative process as a “last resort” rather than a way to short-cut the legislative cycle. “It is nothing short of unconscionable that millions of law-abiding Californians are being used as chess pieces in a twisted political game to see who can race to the bottom first,” said Craig DeLuz, legislative advocate for the gun rights group Firearms Policy Coalition. • SB 880 (Hall): Bans common and constitutionally protected firearms that have magazine locking devices. • SB 894 (Jackson): Victimizes victims by criminalizing the failure to report lost and stolen firearms. • SB 1006 (Wolk): University of California taxpayer funding for gun control research. • SB 1235 (Deleon): Restrictions on ammunition purchases, creates a DOJ database of ammunition owners. • SB 1407 (Deleon): Retroactively requires serial numbers be placed on firearms dating back over 50 years. • SB 1446: Confiscation of lawfully acquired, standard capacity magazines that can hold over 10 rounds. • AB 156 (McCarty): Formerly dealt with global warming, but is now the same as SB 1235. • AB 857 (Cooper): Formerly addressed greenhouse gasses, but is now the same as SB 1407. • AB 1135 (Levine): Formerly centered around groundwater but is now the same as SB 880. • AB 1511 (Santiago): Formerly dealt with energy conservation, but now criminalizes loaning of firearms between personally known, law-abiding adults, including sportsmen, family member and competitors. The American Suppressor Association sponsored their 3rd Annual Range Day at Knob Creek Range in Westpoint, Kentucky yesterday. Members of the ASA that were there included Sig, Dead Air, Gemtech, AAC, SilencerCo, Yankee Hill, Daniel Defense, the Silencer Shop, and Liberty Suppressors. Knox Williams of the ASA gave out a number of awards to members. As I remember it, Vender of the Year went to the Silencer Shop, Comeback Award went to Gemtech, and Person of the Year went to Josh Waldron of SilencerCo. We (the Complementary Spouse and I) got to shoot a number of the suppressor. Below is a video of her shooting a Ruger 10/22 with a integrally suppressed barrel from Yankee Hill Machine. Everyone and their brother seems to be heading to the NRA Annual Meeting. It took us an hour to get through the gates coming of Interstate 65. That seems the norm no matter which road you are coming in from. 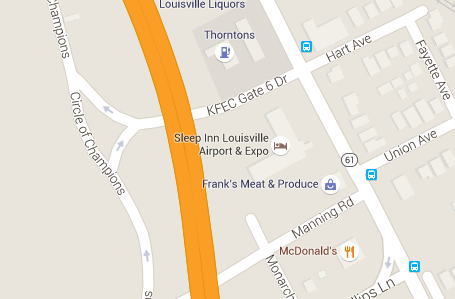 That is, except if you are coming in through Gate 6. We saw very few people coming in that gate and no holdups. Gate 6 is accessed off of Preston Highway. See the map below. I'm probably going to jinx things but I consider this a public service. This came across my desk today. It shows the increase in gun sales, NICS checks, etc. since President Obama was elected. I know I sure as hell have bought more ammo! I also got my carry permit after he was elected. In a case brought by the Pink Pistols, Judge Richard Leon of the US District Court for the District of Columbia issued a preliminary injunction against DC's "good reason" requirement for a carry permit. The case, Grace and Pink Pistols v. DC, seems to have kept under the radar until now. The text of the decision is here. Earlier this year, Judge Colleen Kollar-Kotelly had rejected the arguments of the Second Amendment Foundation in Wrenn v. DC. That case had been sent back to the District Court after it was found that Judge Frederick Scullin of New York had not been properly appointed to hear the case. Fairfax, Va.— The National Rifle Association (NRA) today responded to an order issued by a federal judge in Grace and the Pink Pistols v. District of Columbia that instructed D.C. officials to stop enforcing provisions of the city’s code that barred most D.C. residents from carrying firearms for self-protection. In the ruling issued today, Judge Richard J. Leon of the U.S. District Court for the District of Columbia concluded that the district’s law is likely unconstitutional and that the plaintiffs who are challenging it in court would be severely harmed if the district were allowed to continue to enforce its ban while the lawsuit went forward. The judge held that the district’s “overly zealous . . . desire to restrict the right to carry in public a firearm for self-defense to the smallest possible number of law-abiding, responsible citizens” unconstitutionally flouted the Second Amendment. In 2008, the Supreme Court struck down a D.C. law banning most citizens from possessing handguns at all, reasoning that such a ban was flatly inconsistent with the individual right to keep and bear arms guaranteed by the Second Amendment. The district continued to enforce its ban on carrying firearms in public even after that ruling, however, and a federal district court struck that separate ban down in 2014. The district responded by enacting a new “licensing” scheme that only allowed its residents to carry firearms in public if they could show a specific, documented need for self-defense—for example, by proving that they had been attacked or were receiving death threats. The city issued a minuscule number of licenses, and the scheme had the practical effect of a full ban. “Legislation that restricts the law-abiding does nothing to reduce crime and is unconstitutional. 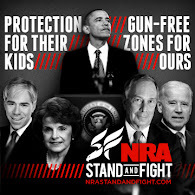 The NRA is glad that fact was recognized in federal court today,” concluded Cox. The ruling prohibits law enforcement from enforcing the concealed carry ban temporarily while the constitutionality of the ban continues to be argued in court. The NRA will continue to support this suit financially. Professor Eugene Volokh has his analysis of the case here. Here is what the Second Amendment Foundation said about their win in the 9th Circuit Court of Appeals yesterday. BELLEVUE, WA – A three-judge panel for the U.S. Ninth Circuit Court of Appeals has issued a 2-1 ruling that “the right to purchase and sell firearms is part and parcel of the historically recognized right to keep and bear arms” protected by the Second Amendment in a case brought by the Second Amendment Foundation. SAF was joined in the case by the California Association of Federal Firearms Licensees, the Calguns Foundation, Inc., and three businessmen, John Teixeira, Steve Nobriga and Gary Gamaza. SAF was represented by noted California civil rights attorney Don Kilmer, and the case was supported by an important amicus brief filed by Virginia attorney Alan Gura for the Citizens Committee for the Right to Keep and Bear Arms. Gura won both the Heller and McDonald Second Amendment rulings before the U.S. Supreme Court. Second Amendment attorney David Kopel does a great job in breaking down the case in a post on the Volokh Conspiracy. It is well worth a read to get a great understanding of the case. Professor Eugene Volokh also provides a summary of the case here. However, in my opinion, it is not nearly as comprehensive as that of David Kopel. If you only have time to read one, read Dave's. I got a press release from Laura Burgess Marketing today regarding the relocation of Andy's Leather from New Hampshire to Nebo, North Carolina. While the move actually took place a few months ago, its good to see this going out. Stop by Andy's booth at the NRA Annual Meeting if you want to see a Ching or Rhodesian Sling along with his belts. I have all three and can attest to their quality. Move to new location provides Andy's Leather with a modern workshop outfitted with high powered equipment. Nebo, N.C. (May 2016) - Andy's Leather, purveyor of fine leatherwork for rifles, Scout rifle slings and accessories, is proud to announce it has relocated its business to Nebo, North Carolina, effective immediately. The move will provide Andrew Langlois, founder and owner of Andy's Leather, Shottist and The Scout Rifle Forum, with a more modern shop equipped with higher powered equipment and an appealing office space. "After 20 years in New Hampshire and Vermont it was time to escape the frozen northeast for warmer climates, to spend less time shoveling snow, to be closer to my kids and grandkids and to expand and upgrade my shop," commented Langlois. Andy's Leather will be exhibiting at the 2016 NRA Annual Meetings and Exhibits, May 20-22, 2016 in Louisville, KY at booth #4305. Products on display will include Scout Rifle slings, the hit selling Rhodesian Sling, the three-point Ching Sling and a line of holsters. Langlois will be making belts at the booth that will be custom fit to the individual customer. The new IWB will be available on www.shottist.com after the show concludes. Yesterday, the 9th Circuit Court of Appeals remanded Teixeira, et al. v. County of Alameda to a lower court with the instructions to use the correct level of scrutiny. The court found that the "right to buy and sell guns is part and parcel of the Second Amendment." As I am racing to get ready to leave in the morning for the NRA Annual Meeting, I don't have time to do a full blog post on the decision. Thus, I will just post the releases from the winning plaintiffs. Victory! It is something that gun owners in California can't often claim. But CGF, alongside California Association of Federal Firearms Licensees and the Second Amendment Foundation, scored an important victory in the Ninth Circuit Court of Appeals earlier today! The opinion, issued this morning in the case of Teixeira, et al. v. County of Alameda, held that the Second Amendment right of gun purchasers extends to protect gun retailers from being shut out of an area. But, according to a scientific study conducted by the plaintiff, which included a geographic study of the entirety of Alameda County, there are no parcels within the county that meet the ordinance’s requirements. This is such an integral case to our fundamental rights, and we are winning! I was in Sam's Club last week and saw this display for a Garmin GPS unit. They promise pre-loaded maps for the lower 49 states. So is the 49th state Alaska or Hawaii? Perhaps we just incorporated Canada as one big state. I wouldn't be surprised that the Obama Administration would have Canada as one state because then it would be bigger than those awful large red states of Texas and Alaska. Facebook has a policy of denying to carry ads that promote the sale of firearms. They are in the private sector and that is their option. However, sometimes their algorithms used are lacking. A case in point is my friend Professor David Yamane who publishes the Gun Culture 2.0 blog. He had an ad denied by Facebook's faceless minions because they thought it promoted the sale of firearms and other weapons. He was advertising a link to his report on the USCCA's recent Concealed Carry Fashion Show held in conjunction with their expo in Atlanta. They had previously accepted an advertisement for his blog that was titled, "Bushmaster is the Worst Marketer in the History of Guns." David said, with his tongue firmly in his cheek, that Bushmaster was bad at advertising since so few of its firearms (or any AR-15) were used in homicides. This is ridiculous. Just like his series of posts on the gun industry which highlighted the fact that the gun industry isn't just the Rugers and Smith & Wessons, this post doesn't promote the sale of any product. Mark Zuckerberg plans a series of meetings with conservatives. Perhaps he needs to go to the next USCCA Expo in Ft. Worth or this weekend's NRA Annual Meeting to see that the gun industry isn't just guns. A gunpocalypse will hit the California legislature this morning. A total of 10 bills will go to the Senate Appropriations Committee that seriously impact gun rights in California. These bills range from banning the bullet button and funding gun prohibition research at the University of California to setting up a database of ammunition buyers and confiscation of standard capacity magazines. The California legislature obviously feels it is better to deal with these type of issues as a smokescreen to hide their inability to deal with their horrendous budget issues. Smoke and mirrors is a Hollywood tradition that the sponsors of these bills have learned well. The Firearms Policy Coalition issued a release that lists each bill by number along with what it does. They have a page of their website that allows you to send a message on each bill. If you live in California, call your legislator. I hope you've already done it. SACRAMENTO – Monday, May 16th 10 anti-gun bills will be fast-tracked through the California State Senate Appropriations Committee. The hearing agenda includes four Assembly bills that were gutted and amended a week earlier in an effort by Democrats to avoid a full vetting by legislators. And even more outrageous is that three of those measures will meet their evil twins (Senate Bills containing the exact same language) and be voted on at the same time. “The only way to describe this full-on assault on gun owners’ civil rights is to call it what it is - Gunpocalypse”, stated Craig DeLuz, Legislative Advocate for the Firearms Policy Coalition. • SB 1407 (Deleon): Retroactively requires serial numbers to be placed on firearms dating back to 1899. • SB 1446 (Hancock): Confiscation of lawfully acquired, standard capacity magazines that can hold over 10 rounds. • AB 1511 (Santiago): Formerly dealt with energy conservation, but now criminalizes loaning of firearms between personally known, law-abiding adults, including sportsmen and hunters. UPDATE: Here is an email sent out by the Citizens Committee for the Right to Keep and Bear Arms which includes the phone numbers of the members of the Senate Appropriations Committee. Call them. Your Urgent Action in California Needed! The gun grabbers in California are on the attack again. If these bills pass, they're one step CLOSER to Governor Jerry Brown's desk. The bills up in committee include a BAN on all "bullet button" firearms, a BAN on ammunition sales, and CONFISCATION of your legally owned firearms parts. We need YOU to fight these bills NOW! CALL the Senate Appropriations Committee members listed below now—ask them to vote NO on the anti-gun bills mentioned in this e-mail. UPDATE II: You can watch this train wreck live on The California Channel. You often get the plastic sporks (spoon with fork tines) in fast food restaurants. I've read that prisons use them a lot because it is hard to make it into a weapon. CRKT makes a couple of sporks mixed with bottle openers and other tools. I have the one designed by Liong Mah and its quite handy. I keep it in my travel kit. I just read this weekend that Ka-Bar is coming out with a Tactical Spork. It has a handle based upon their Bowie-style Ka-Bar knife. Moreover, unlike your other sporks, this one has a serrated knife hidden in the handle. I guess there is nothing that can't be sold if it has the word "tactical" in its name. That said, if Ka-Bar has one at their booth at the NRA Annual Meeting, I'll probably buy a couple since their MSRP is only $6.93. I have made the decision to set up a NFA Trust and buy a suppressor or two in advance of the ATF 41F implementation date of July 13th. I'm going the trust route for a couple of reasons. First, it will make estate planning easier as the suppressor will be passed on to the trust beneficiary without the need to pay another $200 tax. Second, other members of the trust will be allowed to use the suppressor without my being with them. It circumvents the potential constructive possession problem for the Complementary Spouse as she does know my safe combination. The issue of fingerprints and photos is irrelevant for my purposes but it is nice to be able to avoid it - for now. There are a number of prototype NFA trust documents being offered on the Internet. You can get them from suppressor dealers like the Silencer Shop, manufacturers like Silencerco, and a number of attorney-related websites. The cost of these prototype documents are in the $99-199 range. This is a significant cost savings over the estimated $350-500 that an attorney would charge for a "custom" NFA trust. At last year's Annual Firearms Law Seminar, the BATFE attorney from the NFA section offered some horror stories on NFA trusts that were set up without the hands-on assistance of an attorney. Yesterday I took advantage of a Gearhog discount offer of a NFA trust for $49. This was a 75% discount off the normal price of $199 from www.199trust.com. This discount offer runs for another two days. My rationale was that I'd not be out of much money if I decided this trust document didn't meet North Carolina trust law standards. Has anyone gone the prototype or prewritten trust route? If so, did you run into any problems? If you did go the prototype trust route, did you have it reviewed by a local attorney to make sure it met the trust law of your state? Would you suggest having a local estates attorney review the trust? What were your reasons for using a trust instead of purchasing the NFA item as an individual? If you went the prototype route, did you later have the trust rewritten by a local attorney? I would love to know your experiences. You can either leave a comment below or email me at jpr9954 AT gmail DOT com. I get a number of press releases from firearms manufacturers, tactical companies, and outdoor companies. With the NRA Annual Meeting fast approaching, this number is increasing. Below you will see a press release I got yesterday. I am presenting it without comment as any comment I'd make would be considered either snarky or snobbish. MKS Supply, LLC, Dayton OH May 2016- MKS Supply the exclusive marketer of Hi-Point Firearms and Inland Manufacturing (.30 caliber M1 Carbine and new 1911s) invites all attendees at the 2016 NRA Convention to drop by and see these and some new (not yet released firearms). So, if you are attending the NRA convention we hope you will stop by the Hi-Point/MKS Supply booth 2662 and talk guns with Charlie, Ron and the gang. You will learn about some neat new things to come and see some really popular (and new model) guns. Ian McCullom is a really nice guy. I had a chance to meet him at the 2016 SHOT Show along with his friend Karl Kasada. That said, there are times you could just hate the guy because he gets to play with all the old cool toys and we don't. Following up on his interview with noted flamethrower historian and technical expert Charles Hobson, Ian of Forgotten Weapons now has a question and answer session with him. 0:40 - Still in use today? 6:18 - Do they blow up if shot? 24:10 - Is there still a role for flamethrowers in modern war? Just as not all Republicans are pro-gun rights, neither are all Democrats anti-gun. Though, I must admit that it is easier to find a pro-gun rights Republican in California than to find a pro-gun rights Democrat. The Firearms Policy Coalition has just released their analysis of California legislators' voting records. Unfortunately, there are a lot more F and F- grades than A and A+ grades. Such is the hellhole that is the California Senate and Assembly when it comes to gun rights. SACRAMENTO - Just as vote-by-mail ballots are about to land in mailboxes, the Firearms Policy Coalition is releasing their legislative report card for the 2015 legislative session. Each legislator is graded based on how they handled priority legislation. Actions such as voting record, authorship and co-authorship of bills were included in the analysis of their records. The highest scores in the California State Legislature belong to Republican Assemblymembers James Gallagher and Melissa Melendez, as well as Republican Senator Tom Berryhill, who all scored an A+ grade—and have been labeled Defenders of Liberty; a distinction that not only demands a stellar voting record, but also requires the member to actually author or co-author a pro-gun bill. Other notables include top scoring Democrats Senator Richard Roth who received an “A” and Assemblymember Jim Frazier with a “B”. In contrast, Senator Hannah Beth Jackson, and Assemblymember Nora Campos bottomed out their respective houses scoring the lowest grade of “F-” and could be considered the most committed anti-gun owner and anti-gun rights Members of the Legislature. May 6th is the day that we celebrate National Nurses Day. It is the beginning of Nurses Week which concludes on May 12th, the birthday of Florence Nightingale. Unlike what you see on Grey's Anatomy, it is the nurse who gives the shot and not the doctor. Unlike what you saw on Nurse Jackie, very few nurses are drug addicts stealing medicine from the patient. Unlike what you saw on Ben Casey or Dr. Kildare, nurses are not just subservient pretty little faces whose job it is jump when the doctor says jump. No, nurses are the professional health care givers who provide the backbone of our health care system. Much of their job isn't exciting and doesn't make for good television but is utterly necessary. So on this National Nurses Day, I want to salute nurses everywhere and especially my own special nurse, the Complementary Spouse. 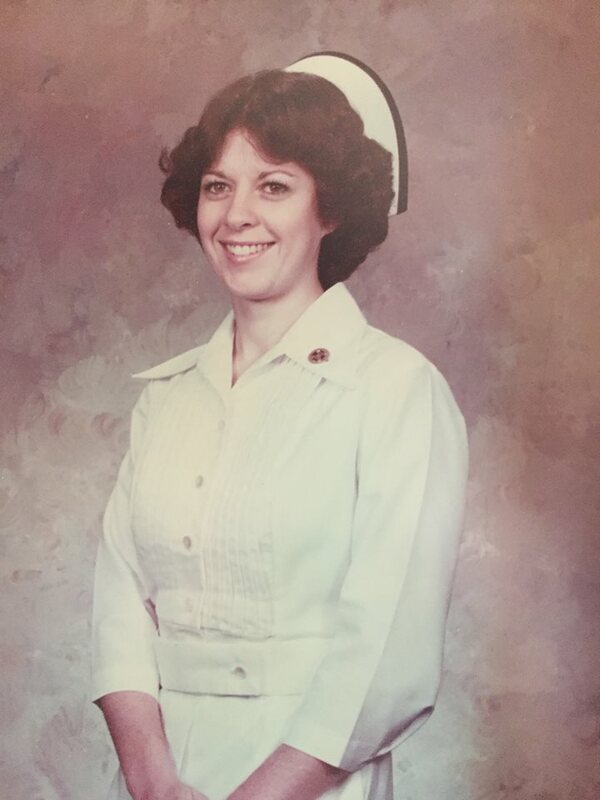 I am told by the Complementary Spouse that the only time she wore this white uniform with the pin and nurses cap was for this photo and at her graduation from nursing school. I won't say what year she graduated other than to say it was in the last quarter of the 20th century. Basically, I'm an honest person. You ask me a question, I'll give you the best answer that I know how. That said, I lied yesterday. I am switching internists. My old doctor, nice (and competent) though she was, never was on time. It drove me crazy to be the first or second person on the schedule and she was still late. So I switched. When you are establishing a relationship with a new physician, they ask a lot of questions. Are you married? Who is your emergency contact? Are your parents still alive? Et cetera, et cetera, et cetera to quote Yul Brenner in The King and I. So I am sitting in the examining room with the medical office assistant and she is going down the list of questions. She gets to a few she called "safety questions". You know where I am going with this. She asked, "Are there any guns in the home?" Rather than giving an evasive answer of "no comment" or asking "why do you want to know? ", I gave a clear, definitive "NO". I freely lied and I would do it again. I was confirmed in my decision to lie when as the doctor was asking more medical history questions he stopped and apologized saying they were due to ObamaCare. I said I don't have ObamaCare and he said they still force us to ask them. He was an experienced physician who had been practicing for many years and you could tell the bureaucratic oversight of his profession was driving him nuts. I know and he knows that somewhere some faceless bureaucrat sitting in some Federal agency will be data mining my responses. As I joked with the Complementary Spouse later in the evening, I said we don't have any guns in the home - we have firearms. On a serious note, I can't tell you how to answer this question. I am firmly in the camp of it is none of their business. If you have to lie to protect your privacy and your Second Amendment rights, is it really a lie. Maybe yes, maybe no but you'll have to let your own conscience be your guide. In the third bit of gun industry news, Remington Arms has announced a limited lifetime warranty for all Remington firearms produced after January 1, 2016. In celebration of its 200th year in business, Remington Arms is introducing a new limited lifetime warranty for all Remington firearms purchased on or after Jan. 1, 2016. The warranty covers the original purchaser of a new firearm from defects in materials and workmanship for the duration of their ownership of the firearm. It allows for repair or replacement of any part(s) of the firearm, or replacement of the firearm if un-repairable, so long as all other requirements of the warranty are fulfilled*. All products purchased Jan. 1, 2016, or after are covered by the limited lifetime warranty offer. Remington Arms was born in 1816 when Eliphalet Remington II turned his first rifle barrel in his father’s New York State forge. He soon began making his own flintlock rifle, selling thousands to American gunsmiths and creating a name for himself in the firearms business. Twelve years later he and the factory were in Ilion, a city that has become synonymous with Eliphalet’s firearms. From there Remington won military contracts, armed the Federals in the Civil War, and saw his three sons join him in what became a family business. In its 200 years Remington has introduced truly paradigm-shifting creations, from the Model 700 to the 870. With handgun designs providing an important piece of the company’s portfolio in its early years, Remington once again offers pistols with its 1911 and .380 ACP varieties. For more information on the warranty and to learn more about Remington’s history, visit remington.com. Coming on the heels of Remington's troubles regarding triggers in the Model 700 and the R-51 debacle, perhaps this is an effort to assure consumers that their troubles are in the past. I will be checking out their booth at the NRA Annual Meeting later this month. Commentary on Facebook hasn't been too generous. Grant Cunningham posted news of the new warranty with this comment, "Somehow I don't think many R51 owners will be impressed." The other comments were even less generous. Speaking of the R-51, Richard Johnson of Guns, Holsters and Gear reports that he is hearing rumors that Remington will reintroduce the pistol at the NRA Annual Meeting. If so, that lifetime warranty was announced in the nick of time for potential buyers! PS: I don't think it is smart business for a company headquartered in Madison, North Carolina with their largest operations in Huntsville, Alabama to be bragging that they "armed the Federals in the Civil War." Are they trying to appease the anti-gun social justice warriors who want any vestige of the Confederacy erased by saying "we were for the other side"? Continuing to talk about the gun industry, and more specifically the ammunition component of it, Orbital ATK announced a big order today. Orbital ATK, Inc. (OA) (NYSE (NYX): OA), a global leader in aerospace and defense technologies, announced today that it has received orders totaling $210 million to produce small caliber ammunition for the U.S. Army. Orders were placed for .50 caliber, 5.56mm and 7.62mm ammunition under Orbital ATK’s supply contract to produce a variety of small caliber ammunition for the U.S. government at the Lake City Army Ammunition Plant (Lake City) in Independence, Missouri. Orbital ATK was formed from the merger of ATK and Orbital Sciences in February 2015. At the same time, the consumer firearms, consumer ammunition, and sporting businesses were spun off into Vista Outdoors. The Orbital ATK Annual Meeting will be held tomorrow. They have released this presentation which goes over what will be presented at the Annual Meeting. We are going into what stock analysts call earnings season. This is when public companies announce their earnings for the quarter and either meet or surpass expectations or fail to meet the projections of analysts. Olin Corporation announced their earnings yesterday. In addition to their chlor alkali and other chemical businesses, Olin owns Winchester ammunition. Olin lost $37.9 million or 23 cents per share mostly due to restructuring costs for their chlor alkali business. This loss was considered an $80 million miss on expectations. However, for what concerns us, the Winchester division had improved results. Winchester sales for the first quarter 2016 were $183.7 million compared to $156.7 million in the seasonally weaker fourth quarter 2015, with growth driven primarily by increased shipments to commercial customers. First quarter 2016 segment earnings were $28.7 million compared to $21.8 million in the fourth quarter 2015. The increase in segment earnings reflects higher commercial shipments and lower commodity and material costs. Winchester first quarter 2016 results included depreciation and amortization expense of $4.6 million compared to $4.9 million in fourth quarter 2015. Olin stock closed up 33 cents for the day with a final closing price of $22.17. This is up about $10 from the low earlier this year. I'd like now to turn to the performance of our Winchester segment, which we summarize on slide eight. Winchester sales in the first quarter were $183.7 million, a 17.2% increase over the seasonally weaker fourth quarter of 2015. This growth was driven primarily by increased shipments to commercial customers. We've seen improvement in commercial demand in selected handgun calibers and steady strength in rimfire demand. First quarter 2016 adjusted EBITDA was $33.3 million, a 24.7% increase over the fourth quarter of 2015. The improved results reflect higher commercial shipments and lower commodity and material costs. We are forecasting sequential adjusted EBITDA improvement in the second quarter for Winchester with continued strong commercial demand, especially in pistol and rimfire ammunition, and lower operating cost. Winchester continues to focus on cost reduction and we remain on track to complete the final equipment relocation during the second quarter of 2016. We anticipate that the annual cost savings from this project will reach $40 million. As a result, we believe full year 2016 Winchester earnings will improve compared to 2015, primarily because of incremental savings from the Oxford relocation, lower commodity and material costs, and improvement in volumes, partially offset by lower prices. Improved commercial demand for handgun and rimfire ammo sounds like Gun Culture version 2.0 is making an impact. An editorial today by Jim Shepherd in The Outdoor Wire speculates version 2.0 may be giving way to version 3.0. Either way, the improved sales of ammo by the Winchester Division certainly benefits from it. Note: In full disclosure, I own shares in Olin Corporation. Nothing here should be taken as investment advice to either buy or sell the stock.